Introducing our guest blogger Vanessa Eaves. Vanessa is a local blogger who loves writing and crafting and is the latest addition to our QT team. You will be seeing more of her posts on here and on social media so please stay tuned. If you are anything like me, many of your craft ideas and projects may remain half finished. Time has stood still on that lovely little flurry of creativity, rudely interrupted by the real world. The length of my sons nap time often dictated what I was able to get done. The dog needing a walk or the unexpected arrival of visitors all meant the scurrying away of nice craftiness. The usual busyness of life prevents us setting time aside to get these out again, despite wanting to finish them. Crafting is often a solitary interest. Whilst it’s great to have quiet time it’s also important to connect with others. Creativity is as much a part of our day as any other thing, yet so often drops off the list. 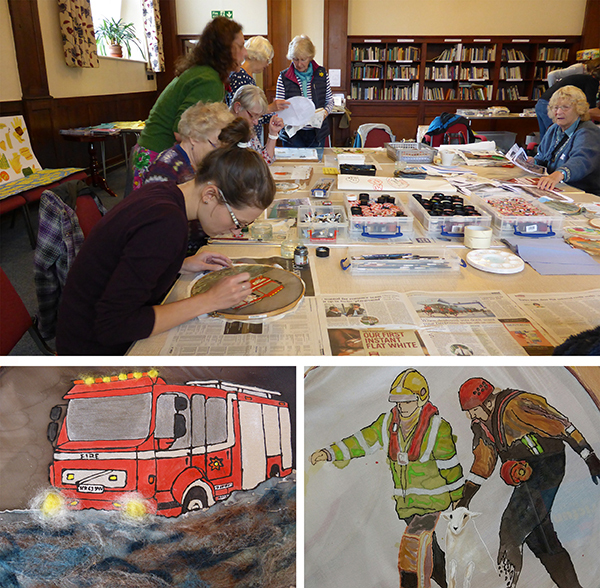 Well, one such group of people do make the time to be creative and to socialise, getting together once a month and spending a day doing their projects half-finished (PHD) Their embroidery projects see the light of day and head towards completion accompanied by friendly faces, encouragement, expertise on hand and a hot cuppa. 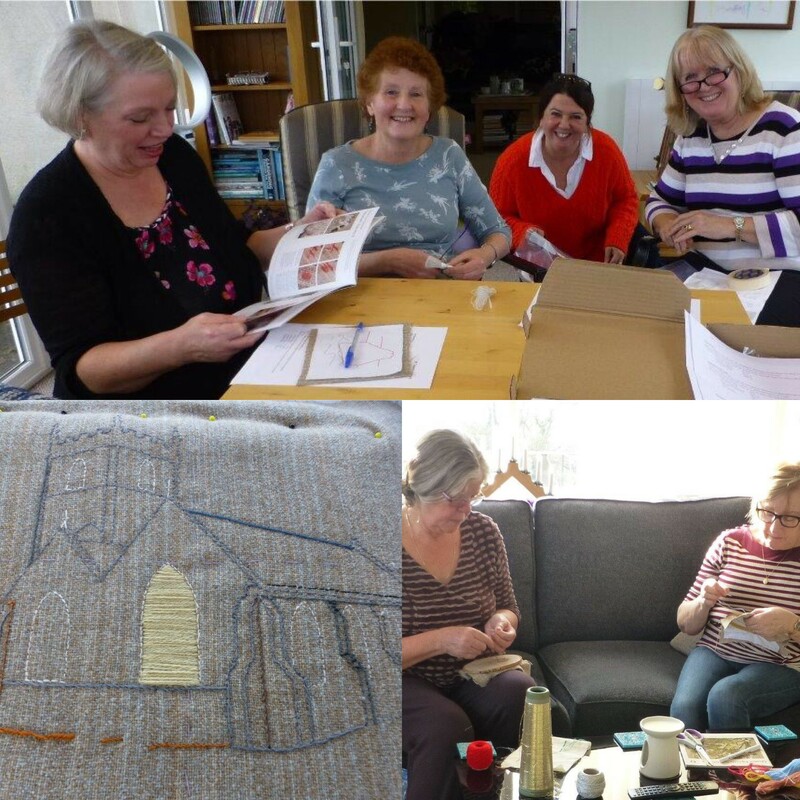 The PHD group is made up of around ten stitchers, all of whom have previously attended a workshop here (that’s the only requirement to join the group), so you are equipped with the basic knowledge of stitching and are familiar with the kits you are working on. 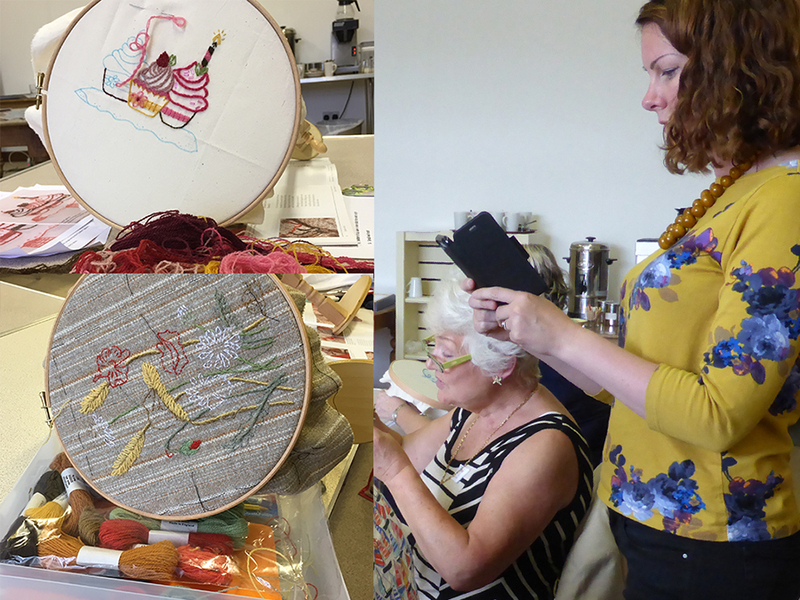 Our workshops start you off on your kit, leaving it up to you to finish at home, where you can adlib, embellish and really explore what you’ve learnt or bring it along to the PHD sessions and finish it off in great company. Meeting here at the Quaker Tapestry Museum, the students can stay for whole or half a day. We have a great cafe on site so there is always the opportunity to have a nice spot of lunch together. The PHD students can swap tips, resources and encourage each other with new challenges and projects. We only ask that you attend one of our workshops before joining the group. Have you have previously attended a workshop and would like to join the PHD group? Please email bridget@quaker-tapestry.co.uk who will put you in touch with the groups co-ordinator.